For as many times as you've watched Top Chef, Top Chef Masters even, your skills ain't quite living up to the fantasy. But that doesn't mean you can't turn out an impressive spread without time spent on the line (that's chef-speak for workin' in a kitchen). Some tricks of this trade are actually surprisingly simple, and you don't need to be a master chef to master these ridiculously easy dishes. Mushing together butter and bits of other things isn't rocket science... or any kind of science, really. But whip out a log of cilantro-lime butter for a simple grilled salmon or corn on the cob and you'll look like a culinary genius. 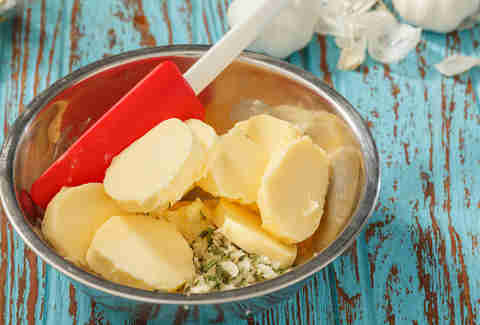 You can mix almost any minced herbs (such as basil), citrus (like lemon zest), or other flavorings (sherry vinegar, shallots, chipotle, to name a few) into softened butter and then chill (Netflix optional). Use it to add great flavor to steaks, grilled fish, pasta, or vegetables. Even easier than compound butter is dumping a bunch of spices together. The key is to lean in and softly, knowingly confess to your friends that it's your very own rub. Just remember Alton Brown's famous rib rub ratio: eight parts sugar, three parts salt, one part chile powder, and one part… whatever else you want. Consider cloves to add earthiness, coriander to add tang, garlic powder for zest, or cumin for a peppery punch. A deceptively simple trick from the Italians (thanks, nonna! 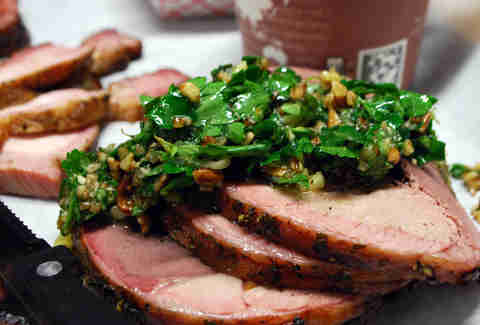 ), gremolata sounds fancy as all heck, but it's basically just an herbal garnish on steroids. Take your parsley (or cilantro, or tarragon, or basil, or sorrel… you get the picture) and mince it with lemon zest and garlic. Traditionally gremolata tops ossobucco (a braised veal classic), but its trifecta of citrusy, garlicky, and herby flavors brings a nice brightness to pretty much everything from scrambled eggs to big ol' hunks of meat. Bonus: It lasts about a week in the fridge. Fancy store-bought roasted tomatoes cost a fortune, but making them at home is almost as brainless as turning on the oven (don't forget that). Preheat the oven to 400F, then cut a bunch of Roma tomatoes in half. 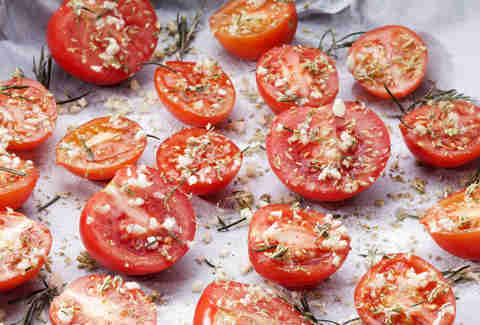 Put them on a sheet tray covered with foil, cut-side facing up, and drizzle with a bit of olive oil, salt, and pepper. (You can add whole garlic cloves or herbs like rosemary or thyme if you're feeling frisky.) Roast them for about 45 minutes, or until they've begun to caramelize. Then let them cool -- their concentrated, sweet flavor is a delicious addition to soups, stews, pastas, a side for meats, or a topper for those grain bowls all the kids are talking about these days. A gastrique is a fancy-AF name for a sauce that tastes fancy AF, but is actually quite simple. Basically, you simmer vinegar, sugar, and some sort of flavoring (fruit, chopped shallots, rosemary) down until it’s a syrup. The sweet-sour sauce is freaking delicious on roasted squash, pork chops, or even over ice cream. Plus, you get to say "GAS-TRIIIIQUE" over and over to everyone at your dinner table. It's not annoying at all. On menus at twee farm-to-table restaurants, dishes like "radish leaf soup with locally blessed creme fraiche" and "carrot top pesto atop humanely raised linguine" sound highfalutin. But they're actually kinda trashy. Literally. 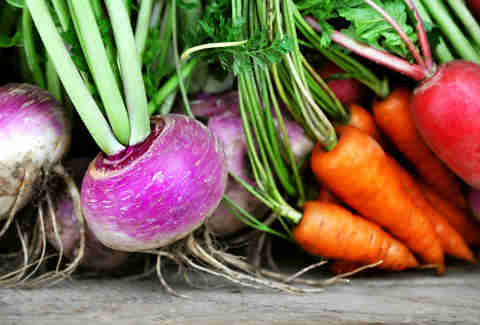 Most of us toss the leafy tops of beets, turnips, carrots, and other root vegetables in the garbage bin. But almost all greens are great if they're sauteed with chopped bacon and garlic (really, what isn't?). And you can turn them into pesto by chopping them finely and mixing them with olive oil, salt, minced garlic, and shredded Parmesan cheese. The other big bonus: You get two vegetables out of one—you don't need to be a highfalutin chef to appreciate stretching your grocery budget. The Peruvian seafood dish seems extra cheffy. But it is literally the easiest thing on the planet to make: Buy nice fish, squeeze on citrus juice. The end. Acids like lime or lemon juice change the proteins in fish, making them appear cooked, and making you an appetizer for a cute little dinner party that takes less effort than heating up Trader Joe's arancini bites. Buy the freshest mild fish you can and put it in the freezer for 15-20 minutes, long enough to firm up but not long enough to freeze. Cut it into half-inch cubes and toss with plenty of lime juice; let it sit in the fridge for another 15-20 minutes. Then toss it with chopped cilantro, chilies, tomatoes, or avocado. After you sear a steak or a pork chop, don't just lick the pan (it burns!) and toss it in the sink (it warps!). Those brown bits stuck to the pan are chef's gold. Just loosen them up by adding a splash of stock or wine, and scrape them off the bottom of the pan over medium heat until they dissolve into a sauce. Remove from heat, add a knob of butter and salt and pepper. You now basically run a Parisian bistro out of your house, minus the screaming chef throwing pans and sulky waiter pretending not to understand the English-speaking customers. Every chef knows the key to a great dish is balancing core flavors -- and, well, not dropping the pan when shouting, "OUI CHEF!" Need to add a quick punch of sour acidity to your dish? Take a vegetable like cucumber, daikon, green beans, red onion -- the sky is very nearly the limit -- chop it up, and toss it in a bit of salt and vinegar. 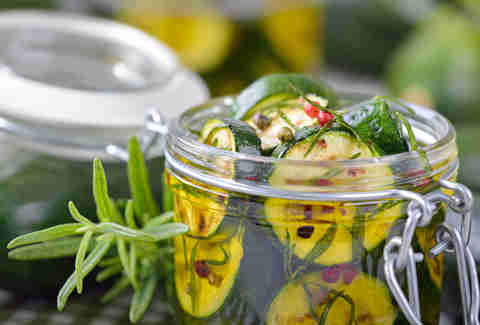 Start cooking your dinner and, 30 minutes later, your pickles are ready to make everything from burgers to donburi pop. Plain old steamed rice is alright. But it takes zero to very little effort to get more kick out of your starch. Like a college dorm, the bulk section of the grocery store is a great place to try new things -- purple sticky rice! Short-grain brown rice! Wild-rice blends! Cook them in stock or butter to add richness and add fresh herbs like thyme or nuts for more flavor. 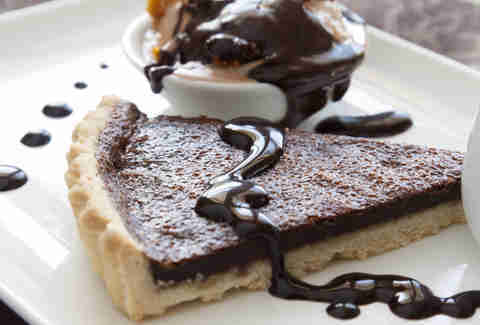 Because sweet tooths need pro tips too: Ganache is where simple desserts become extraordinary. Microwave a handful of chocolate chips with a splash of cream in 30-second increments, stirring between each until you have a smooth sauce. Then take strawberries, cookies, brownies, or vanilla ice cream and coat 'em with chocolate. Need a last-minute dessert? Swing by the bakery aisle of the grocery store for a pre-made cake. When you get home, get slices of it warm and slightly crispy in the toaster, then serve with ice cream. A handful of berries or a drizzle of chocolate ganache (above) wouldn't hurt, either. 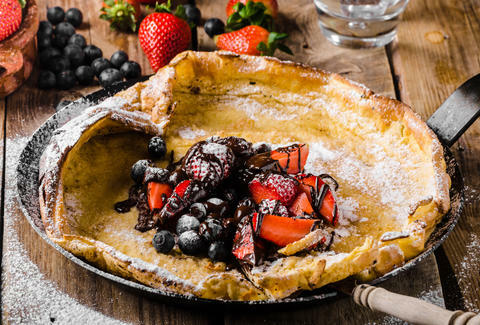 These puffy, showstopping pancakes are a party-trick dessert that even the baking-phobic can achieve with ease. Whip up a batter of eggs, flour, milk, and sugar in a blender -- this recipe from the New York Times works well -- and bake it in a cast-iron pan until it's puffed high and golden brown. It's a showstopper to bring to the table, and you can top it with whatever you have on hand: chopped nuts, fresh fruit, whipped cream, or chocolate chips. Paula Forbes in a food writer living in Austin, Texas who has written for Eater, Epicurious, Bon Appetit, Lucky Peach, and more. Her first cookbook, a compilation of recipes from Austin restaurants, will be published by Abrams Spring 2018.